Surprisingly, the bag was cheaper here in the Philippines by around 25%. Compared to other imported candies here, the price didn’t seem too steep. Sharapova, a sports star, has received flak from nutritionist for promoting a seemingly unhealthy product. Since sports stars are popular with young fans, there are claims that Sugarpova is targeting kids. Sharapova’s agent, Max Eisenbud, denied this though. I have a question for Mr. Eisenbud – Aren’t kids the demographic that eats the most candy? 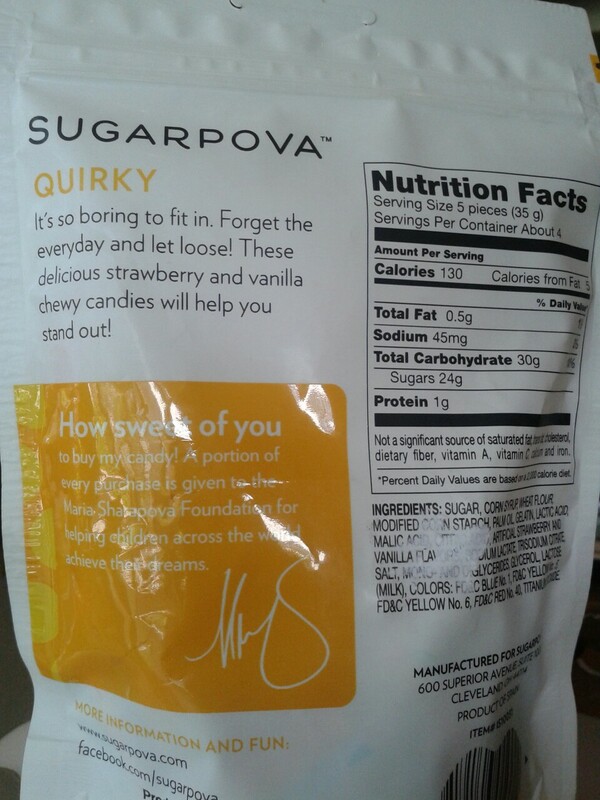 I’ll show you the back of the Sugarpova bag and judge for yourself if the candies are unhealthy or not. “It’s so boring to fit in” – that’s what the label says. 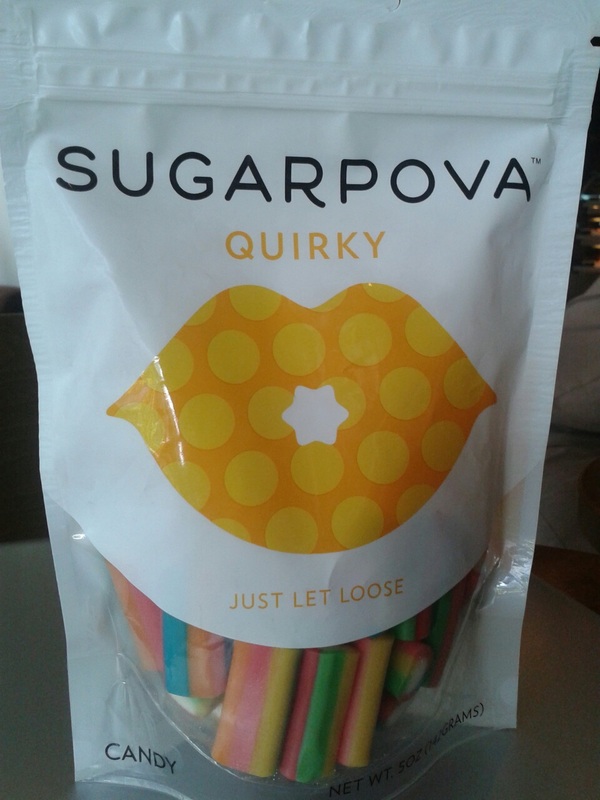 Some of the flavors of Sugarpova include flirty (shaped like lips), sporty (shaped like tennis balls), cheeky (shaped like ordinary gummy bears), etc. They’re all adjectives! A lot of credit has been given to Sharapova’s beauty as the cause of her marketability. She may be pretty, but an important reason why she’s paid top dollar is because of her tennis ability. In fact, the only player better than her today is Serena Williams, her opponent in the 2015 Australian Open Finals on Saturday. Sharapova’s hard work has been rewarded with an Australian Open Finals berth this year. During the past two weeks, her candy company has also been working hard offering Aussies free ground shipping during the tournament to jack up sales. A championship trophy and to finally beat Serena after more than a dozen consecutive losses will be Sharapova’s goal. Since her marketability is also tied to her tennis results; on Saturday, she is also playing for the brands she endorses. The brand that counts most will be Sharapova’s own baby – Sugarpova. Maria even wanted to legally change her name to Maria Sugarpova, temporarily, for the 2013 US Open. She failed to do that. In fact, she failed to even play in that tournament due to an injury. Will the “taste of victory” remain candy or become reality? Find out tonight at the Australian Open. You just gave me an idea. I’ll probably post Super Bowl related investment stuff after the Australian Open. Next Next post: The Australian Open Finalists’ Outfits: The Sponsors Tell You to Buy Them Now!